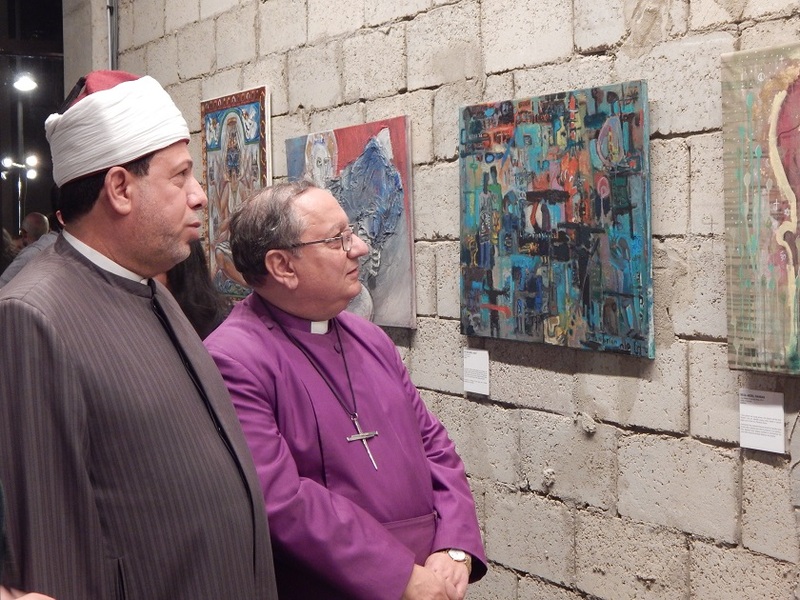 Sheikh Abdel Aziz of the Azhar and Bishop Mouneer of the Anglican Church, observing the CARAVAN artwork. So much is wrong with the Arab world today, it can obscure all that is right. At the heart of both are interfaith relations, and the CARAVAN art exhibition showcases the good while addressing the bad. International in scope, its contributions stretch across continents, touching the famous and simple alike. The event was held at the upscale Westown Hub residential complex, and Nabawi is one of the famous, a group often associated with the arts scene. Prior to Cairo, CARAVAN presented at the acclaimed Eglise Saint-Germain-Des-Pres in Paris, and will travel next to St. Martins-in-the-Field, at the famous Trafalgar Square in London. But it is the simple who are most affected by strife between the religions. And the arts often bypass them. CARAVAN began in Cairo in 2009, seeking to promote interreligious peace and build cultural understanding. Nabawi’s words were well-chosen, for this year’s exhibition is entitled The Bridge. 47 premiere and emerging artists, all with connections to the Middle East, designed works specifically to highlight the unity of the peoples of the region – Muslim, Christian, Jewish, Arab, and Persian. Perhaps this is a message readily received by arts aficionados in Europe and upper-class Egypt. But what about the common man, manipulated by forces touching his faith? Something more is needed, and Anis praised CARAVAN specifically. Paul-Gordon Chandler is the founder of CARAVAN. An American, he grew up as a minority Christian in mostly Muslim Senegal. He was deeply influenced by the local arts scene, but also disturbed by the tensions between the two faiths. There has to be a better way, he thought, but it was not until his years as an Episcopal priest in Cairo’s St. John’s Church that a vision began to form. So while he now tours the world highlighting the religious unity represented in Middle East artists, he desires to see something greater take hold. High-profile public events make possible the changes at street level. 40 percent of proceeds from art sales will benefit Educate Me, an educational initiative supporting the children of an underprivileged neighborhood in Giza. Last year, $48,000 was given to projects in Egypt and Morocco. Spin-off projects for CARAVAN are in development in Jordan and Tunisia, and a Maltese-themed initiative will soon tour every nation of the Mediterranean. Middle Eastern art emerges from the region and is taken to the West, but it also returns to spread the message at home. And lest one think the message of interfaith harmony for the West is only given to like-minded elites, Chandler is also taking The Bridge to rural settings in the United States where misunderstanding of the Arab world is prevalent. And this, for Nabawi, is the hope for CARAVAN and other artistic endeavors in the region. “I am convinced that humanity will prevail,” he said. This article was originally published at the Anglican diocese website.